Martin Breheny: Handpasses 394 vs Footpasses 78 - is this really football? Here's what happened in the two minutes and 50 seconds when play resumed following the horrible injury sustained by Mayo midfielder Tom Parsons in Castlebar last Sunday. Galway's Barry McHugh re-started by kicking the ball 30 metres back to Seán Andy ó Ceallaigh just inside his own half. That's where the hand took over. For the next one minute and 50 seconds, Galway retained possession, handpassing the ball 26 times and footpassing it twice. At one stage, the ball was played back to ó Ceallaigh, who was only marginally advanced on where he started it all more than a minute earlier. Despite the prolonged period in possession, Galway didn't get a shot on goal before having an attempted delivery intercepted. Now it was Mayo's turn. For the next minute, they handpassed (12) their way downfield but nothing came of it as Cillian O'Connor's miscued shot dropped gently into the hands of Galway goalkeeper Ruairí Lavelle. It was almost three minutes of relentless monotony as, first Galway, and then Mayo tried to unlock massed defences. It needed crisp, pacey play but instead the transfers were slow and ponderous, making it relatively easy to defend against. Essentially, it appeared to be a case of retaining possession for as long as possible in the hope that an opponent would lose concentration and leave a channel unattended. As for creativity, it was as rare as goal attempts. Actually, there was only one of those, which Johnny Heaney turned into the match-winner. Mind you, by then the game was in the 74th minute when, after a rare example of a quick, incisive move, Heaney found himself with a clear strike on goal, which not even David Clarke - the best shot-stopper in the game - could keep out. Other than that, Clarke's day was mostly about kick-outs, picking up shots that dropped short and making one spectacular high catch. Lavelle wasn't called on to make a single save, but he too collected quite a few sloppy attempts for points. Now, if the passage of play after Parsons' departure were the only outbreak of sterility, it wouldn't matter but, in fact, it was merely one of several examples on a day when you had to mourn for the state of Gaelic football. Here was a meeting of two counties in the top five, an encounter everyone had pencilled in for months as an early championship highlight. Instead, it turned into a dour grind, where once either team lost possession, they funnelled back en masse, often leaving only the goalkeeper in the opposition half. But then, unrestricted handpassing facilitates that approach. And, boy, did Mayo and Galway provide a glaring illustration of its pernicious influence. By the end, the number of handpasses had reached 394 (Mayo 221 - Galway 173), while footpassing totalled 78 (Galway 40 - Mayo 38). Even then, many of the foot passes were despatched backwards, as indeed were an even higher proportion of handpasses. How many coaches and players at all levels watched last Sunday's game and decided that's the way to go? Of course, many of them have opted for that route already and would have seen it as a masterclass in how to use the handpass and pack defences. 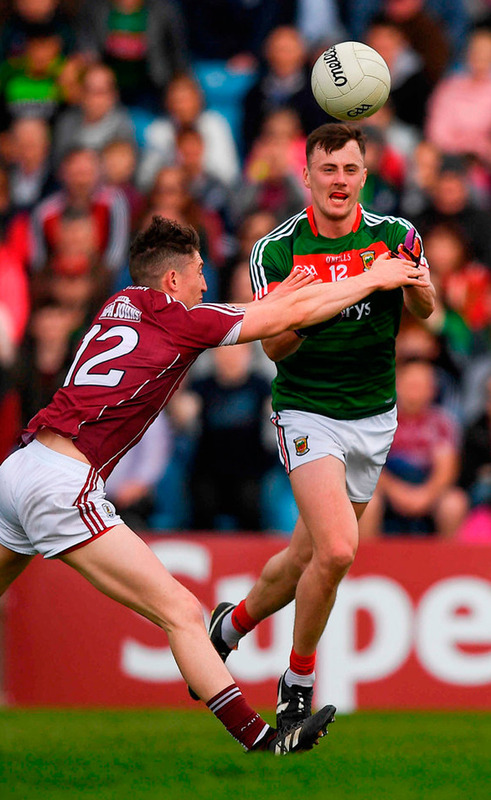 It didn't win the day for Mayo, but then some of their shooting for goal was deplorably bad. That's hardly surprising because if squads spend so long working on handpassing and security lock-outs (and clearly they do because it's not something they can use off-the-cuff on match day), it's logical that less time is available for other skills. Coaches will argue that winning, rather than entertaining, is their sole responsibility, justifying their right to deploy whatever systems they consider best. No arguments there, but what about the custodians of Gaelic football, for whom maintaining entertainment levels should be a priority? Surely, they have a duty to frame the rules in a manner that rewards creativity. That won't be possible without addressing the handpassing epidemic. Applying no restrictions, which encourages runners rather than footballers, has led to a diminution of core skills in favour of a capacity to gallop all day. But at what cost to Gaelic football? Rugby and soccer are always looking for ways to make the game more appealing to the masses while football is allowed to be repeatedly dragged down a dark alley and mugged. Restricting the handpass to a maximum of four, after which the ball must be kicked, would be an interesting experiment. Yes, it would result in possession changing hands more often, but what's wrong with that? Over time, it would lead to more accurate kick-passing, which is a delightful skill. Despite the obviously negative impact of unrestricted handpassing, there appears to be no appetite to tackle it. Why? Can anyone seriously argue that the Mayo-Galway game maximised the potential of Gaelic football? And have no doubt there will be plenty other similar examples over the summer too. I have been watching Gaelic football for over half a century and firmly believe that the curse of the handpass presents a more serious threat to the popularity of the game than anything else in that time. That's not looking to the past with rose-tinted glasses but rather a judgement call on the damage the handpass is inflicting. Hurling, in contrast, has never been better, but then there are no corresponding influences to corrupt it.